Engine Pro has teamed up with Engine Builder Magazine to offer tips and pointers to help improve the efficiency and profitability of machine shops. Check back for monthly additions to our Shop Solutions. In my hone, I keep a large cookie tray under the block I am processing. This creates a settling pond for most of the material that is removed during the honing process. Without the cookie tray, most of the heavy material settles in the hone sump and only the fine materials are carried through to the filters. The cookie tray virtually eliminates having to clean the sump and significantly reduces the displacement of honing fluid by iron particle build up. It also make the filters last considerably longer! Modern rope seal materials are much tougher than the old asbestos types and are nearly impossible to cut clean. I found that a Dremel tool with a small cutoff wheel will give the best and cleanest cut with the least amount of effort. When my ratchets get noisy or sluggish I soak the head in 90wt. gear lube overnight and drain them the next day. The ratchets work like new. I find that 90wt gear lube lasts longer than engine oil and gives smoother operation. I have a quick way to test the integral fuel lines in diesel heads such as the C15 Caterpillar. I install the fuel injectors to block the ports and attached an air chuck to the fuel inlet. Next, fill the exhaust ports with water and pressurize the line. If there are any leaks in the fuel line that pass into the port, they will quickly be apparent. This process can be used for the intake side as well. Sometimes I end up having to paint an engine and don’t really have a dedicated place to do so. I put down a plastic painters drop sheet and paint the parts while guiding a shop vac hose in close proximity to where I’m spraying. A foot or so away is fine. It helps when spraying small parts on a bench too. Make sure you have a good HEPA filter and if it’s dirty, that actually helps. I use a brand name reusable filter and the paint overspray sticks to the dirt on the filter and cleans off with no problem. A high capacity 5-6 hp vacuum works best. You can wet the surrounding floor as well, but I’ve found virtually no overspray within the few feet of the drop sheet. I’ve had other guys try this and they say it works great! Pictured is one I just painted for a car of my own and it's clean all around it! Rewarding existing customers when they share your services with a friend is a great way to generate new business. There are lots of ways to organize a referral program, including some cool eCommerce plug-ins for your website. Another very easy referral program is to write the customer’s name and job # on the back of a few of your business cards. Ask your customer to pass them out with the agreement that your customer AND the referral will each get a reward. 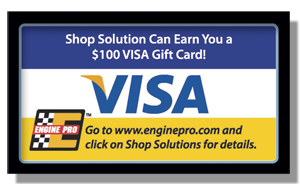 An easy reward might be to buy your customer a $25 prepaid visa card.